Over ten years ago, we released the very first Quarry work boot. Since then, it has become a staple for workers around the country. And now, for the first time, we've brought manufacturing of the Quarry, using imported parts, to our Portland, Oregon, factory, at the same time making major improvements to its comfort and durability. Our top-grain leather is sanded on the outside to give it a slight nap with a velvet-like feel. This leather upper is extremely durable, while offering a shorter and more comfortable break-in period. Our alloy toe meets or exceeds ASTM F2413-11M I/75 C/75 EH standards and ASTM F2413-11 F I/75 C/75 EH. 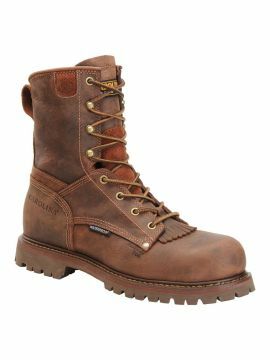 This exclusive outsole features a 90º heel, an oil- and slip- resistant rubber compound, and a non-linear lug pattern for superior traction and debris release.